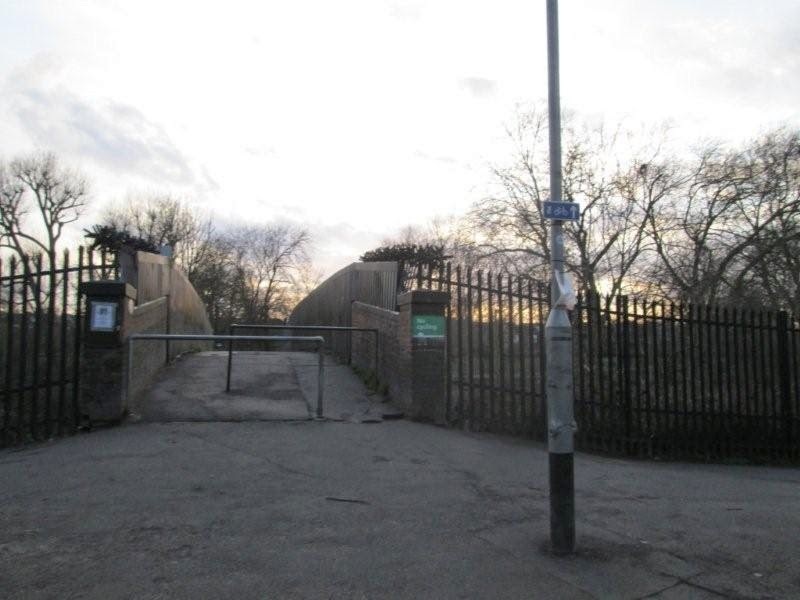 At a location where there are blind corners, like the one above coming off a bridge which meet a path running across it, there is the potential for a near-miss or collision. The woman with her children in a Christiania trike above or a mobility scooter user will have considerable difficulty and may be unable to proceed. 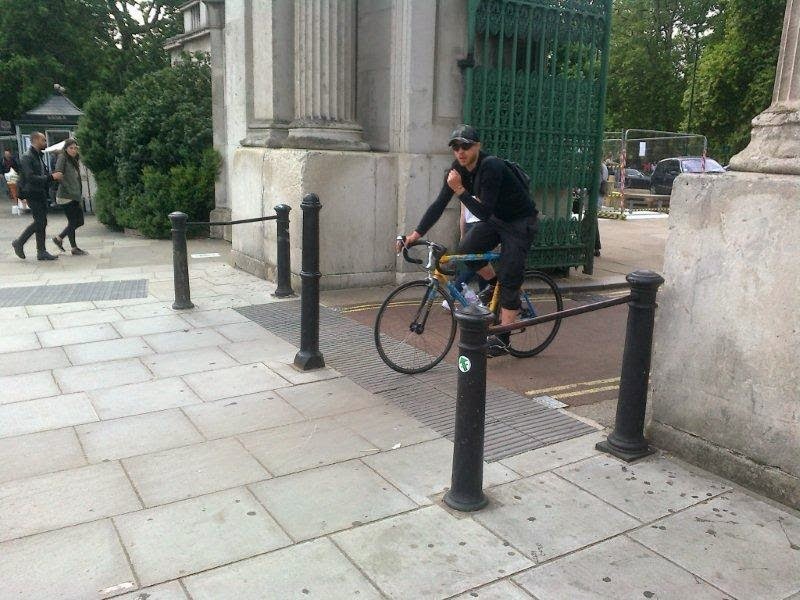 An alternative approach is to try to use bollards, as above, with the same problems likely to occur. 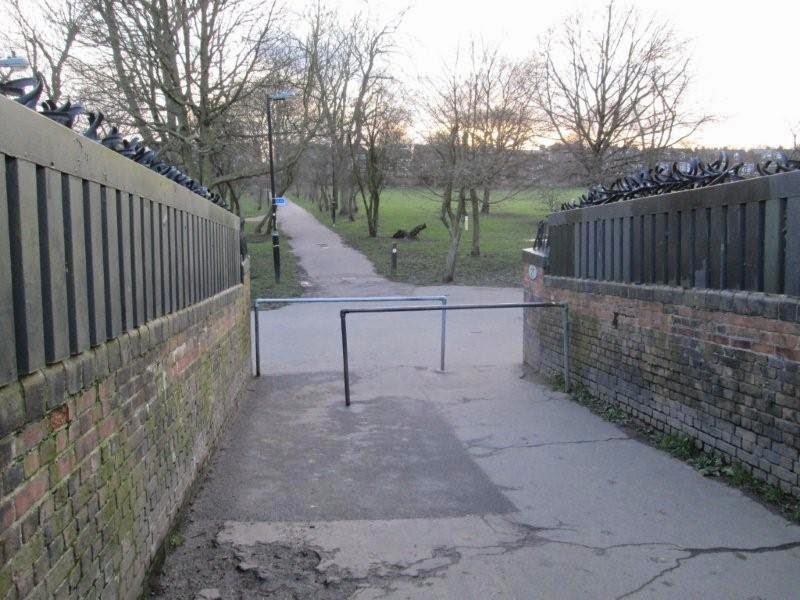 The solution below removes the risk of collision at the blind corner itself and improves sight lines giving people time and space to adapt their position or speed to avoid a collision where the rails end. 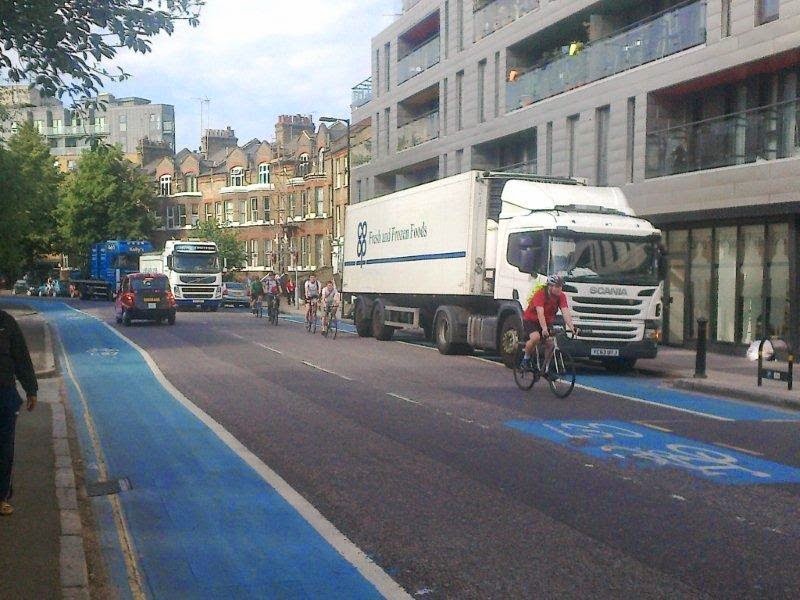 The new London Cycling Design Standards have been published in draft form for consultation. I haven't had a full read of the 350+ pages yet, but I have been considering what to think about when reading it. One thing I will be doing is replacing the word 'cyclist' with 'child' and seeing how reasonable the measures appear in that light. I will also be looking for designs that have 'Forgiveness' built into them. 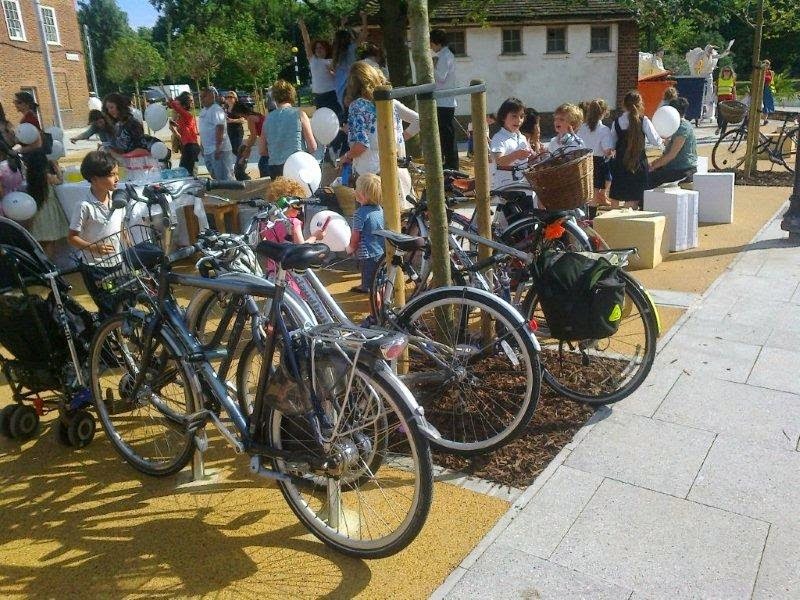 Forgiveness is a key thing that cycling instructors assess when considering which streets to use, whether working with an adult or a primary school group of 9 - 11 year olds. We consider how much space is available, how much deviation from a line will be required (due for example to double parking), what the volume of traffic is and its speed (is the street a motor traffic rat-run). 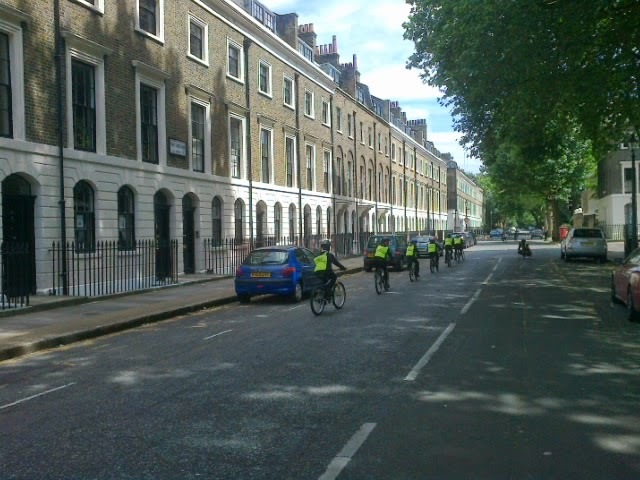 We are assessing how much latitude there is for a trainee to have a wobble or make an error of judgement, and we are assessing how stressful the street is for the trainees to use. Today I was working with pupils in Trinity Street and Trinity Church Square, a wonderfully forgiving environment primarily because it is blocked to through motor traffic at one point. 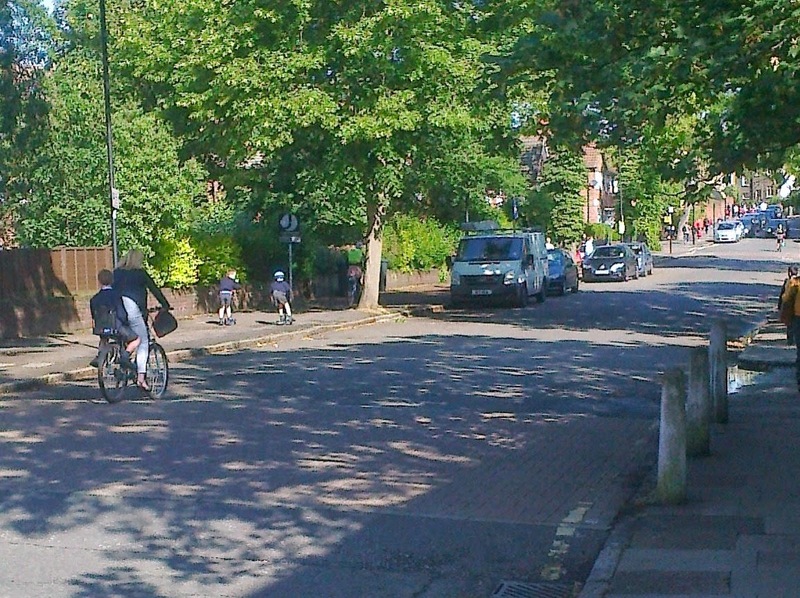 The children were relaxed and most of the other road users were on bicycles too. Traffic is light and speeds are low. The likelihood of a collision and, due to the low kinetic energy of the other traffic, the likely severity of a collision are both low in such a location. 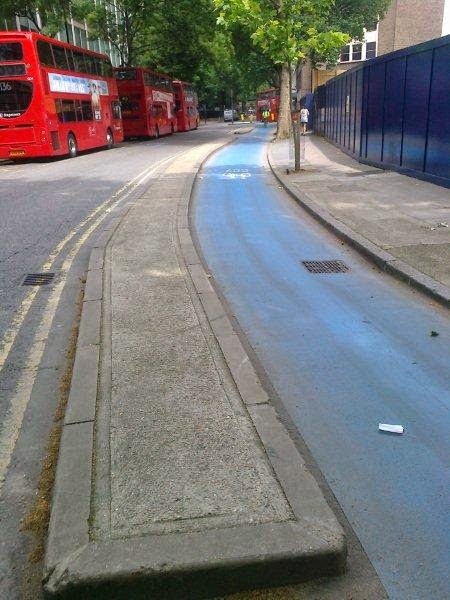 The question then is how to achieve a forgiving and appealing cycling environment on a more major road. 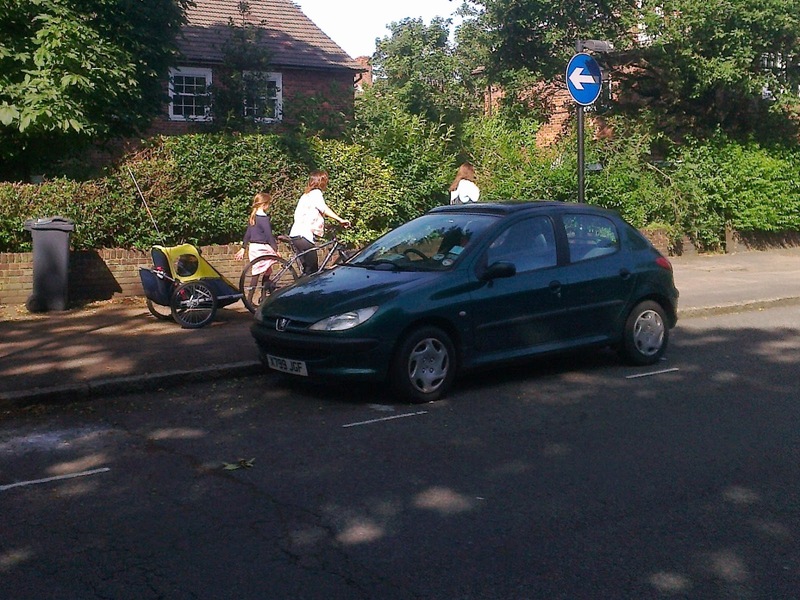 Countries with a high modal cycling share which includes children and grandparents tend to provide a segregated space where there are substantial vehicle movements, traffic speed and/or many heavy vehicles. 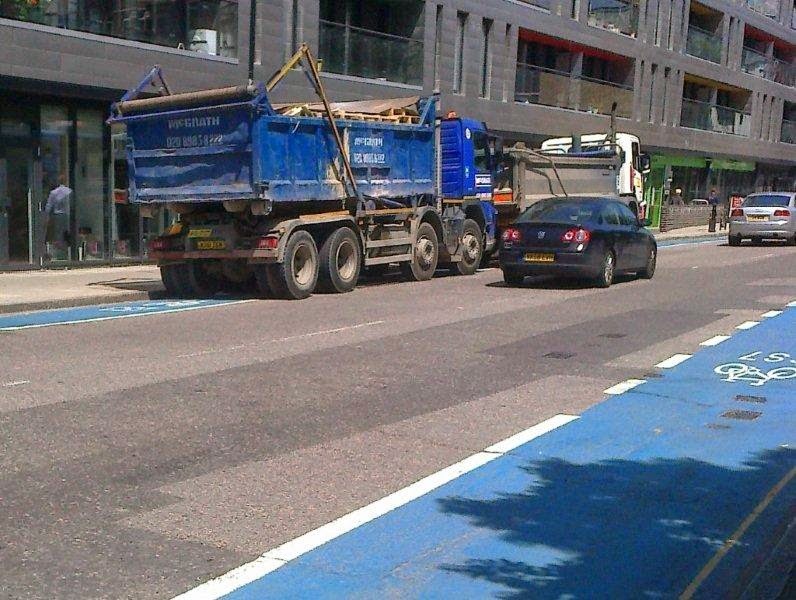 However the painted part of Cycling Superhighway 7 along Southwark Bridge Road - an unprotected cycle lane - is a disaster. 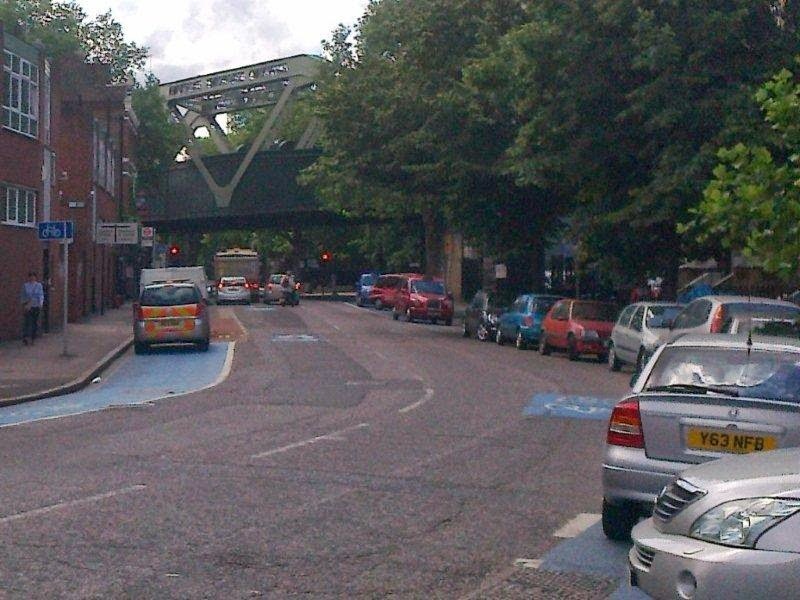 On the right side of the road in the photo above there's a short stretch of car parking instead of a cycle lane. 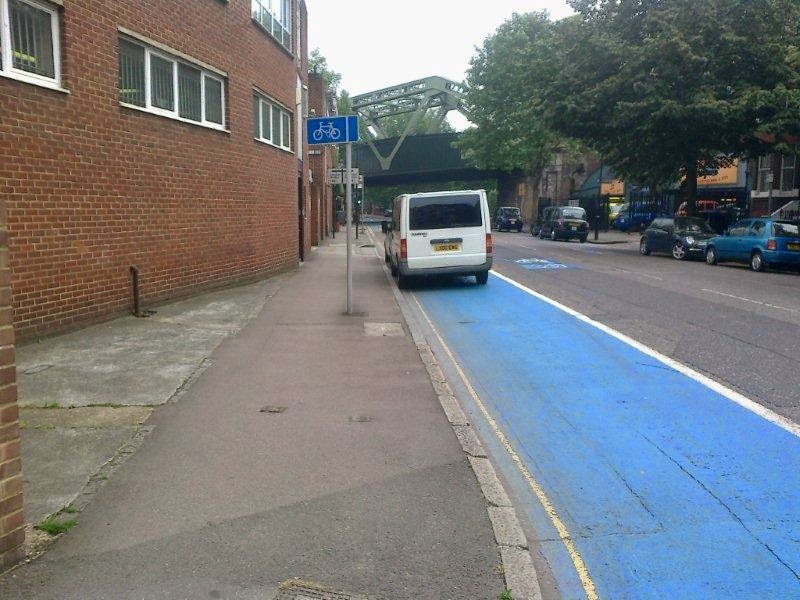 Unsurprisingly a bordering taxi garage routinely parks taxis on the short stretch of cycle lane that leads into the parked cars as you can see above . 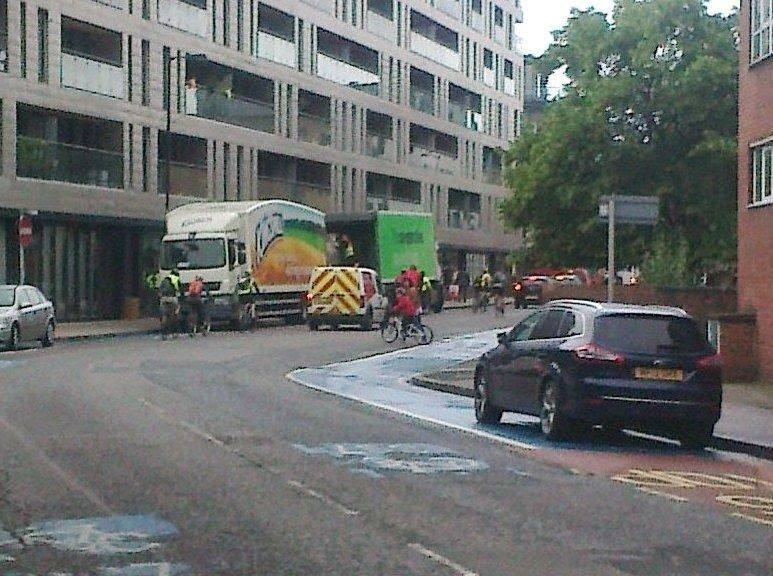 Having passed the taxis and the legitimate car parking, then illegitimate car parking, there's a Cooperative supermarket which occupies the cycle lane for deliveries during morning rush-hour. Here's a delivery this morning. Here's yesterday. 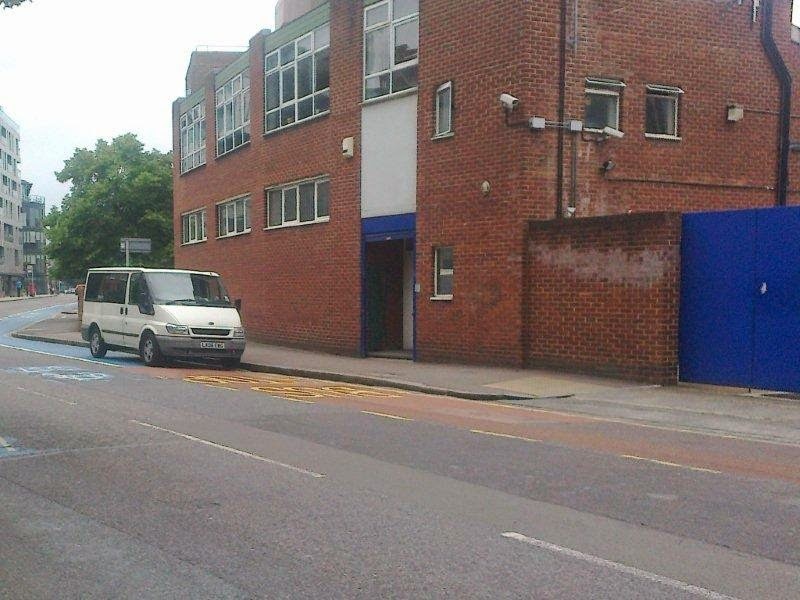 You can see a child (not one I am training) cycling to school, turning right from Scovell Road - but the Coop has stolen his cycle lane. When not being used for Coop deliveries this lane is currently used as a waiting zone for construction vehicles. The other side of the road should have no such issues on the stretch between Great Suffolk Street and Borough Road. There are no shops on this side and no on-street parking (during specified hours). 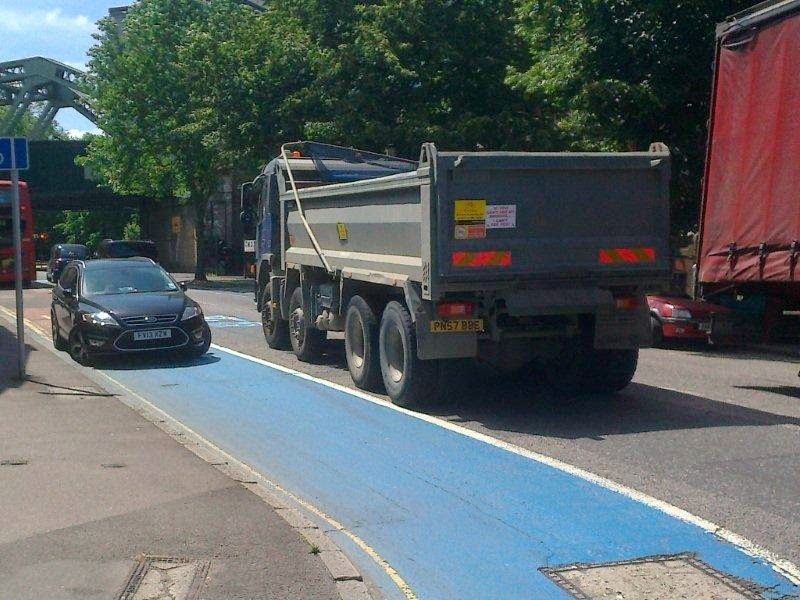 It should be clear space for cycling, somewhere adults and children can cycle away from the lorries. 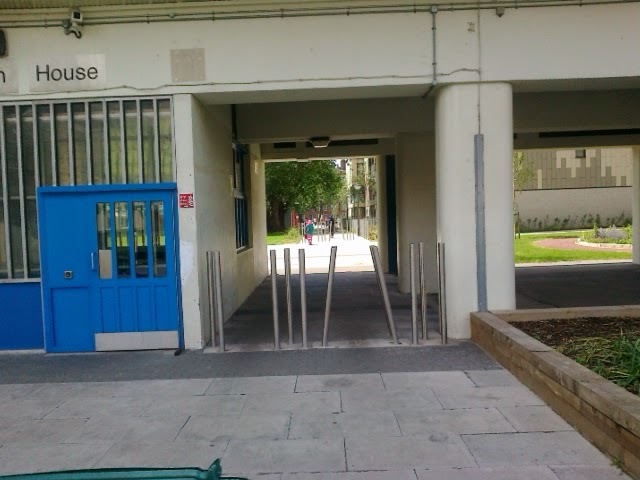 Unfortunately there's a police building located here. 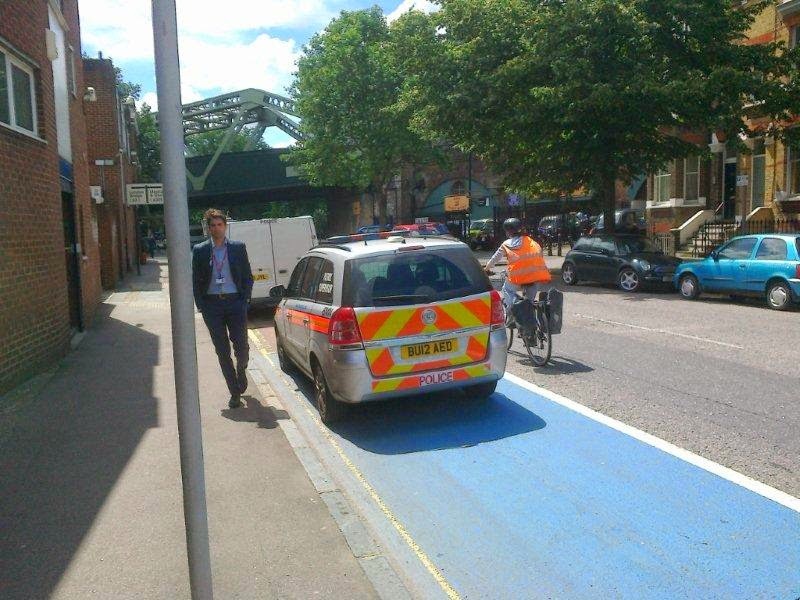 The police can disregard yellow lines I am told, and they do. 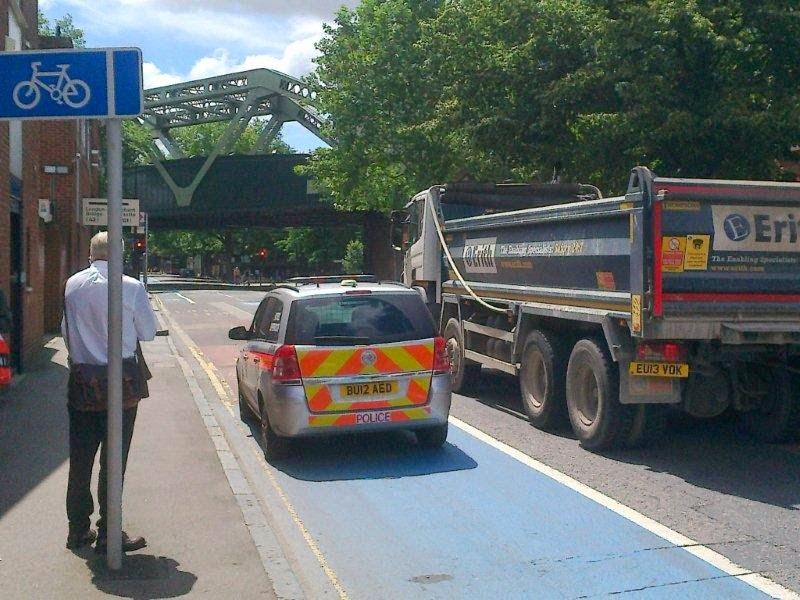 Today this police vehicle was parked on the cycle lane at 12.15 when I went to lunch and was there at 3pm after I had left the school. I doubt it had been moved between times. While the police may have the right to park here it would be civil of them not to. If they need cars to be ready to roar away Sweeney style then this is the wrong location to have those staff. If there isn't any parking then this is the wrong location for them, but I suspect the blue doors shown below lead into a police yard. 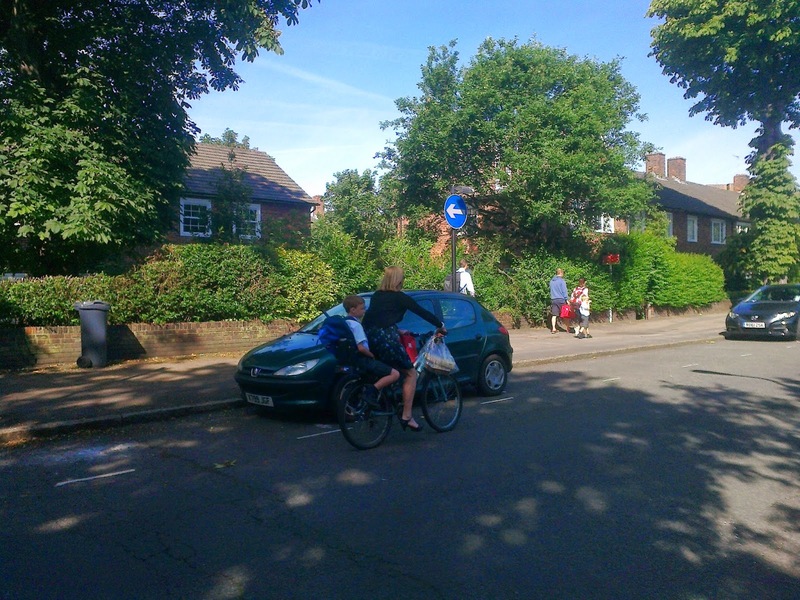 A significant part of cycle training involves teaching young and old cyclists to have respect for and give space to other road users, particularly more vulnerable ones. This is civil behaviour. I think adults and children who wish to ride bicycles should have space away from heavy, fast or large volumes of motor traffic. I think that responsible retailers like the Coop and our enforcers of civil behaviour, the police, should respect the provision that has been put in place. Failing that it seems that London's new cycling design standards need to prioritise more substantial measures to segregate motor traffic away from people riding bikes. An eclectic music performance of country, rock, blues, reggae, cowboy and folk. The Trouser Band breathe new life into some unjustly forgotten ditties of yesteryear. 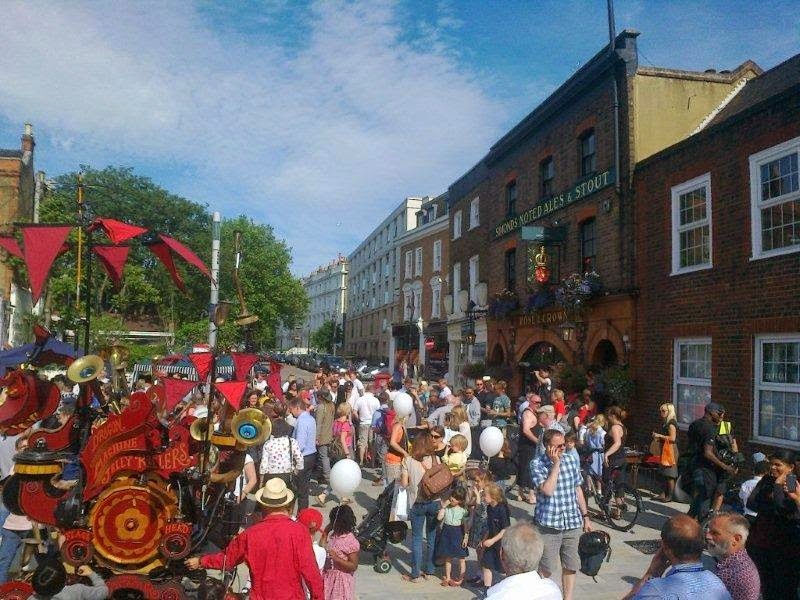 Brixton based six piece with international sound of uplifting music and impressive and foot tapping instruments – fiddle, banjo, mandolin, mandola, double bass, melodeon, Hurdy Gurdy, Darbuka and voice. A free musical performance consisting of mixed concert band repertoire, specialising in big band and show music. A variety of music arranged for saxophones- from baroque to pop, classical to jazz, music of other cultures and everything in between! 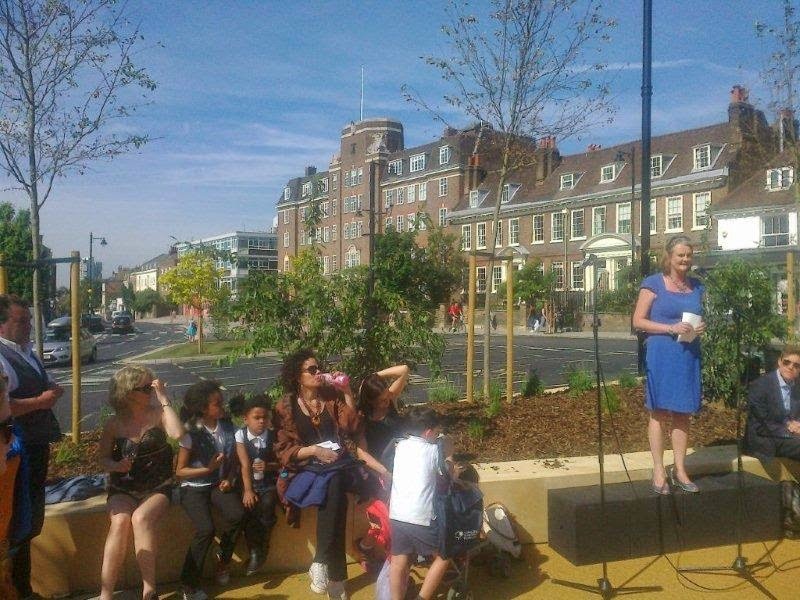 Clapham Old Town's new Town Square was launched today, with Cllr Lib Peck, Lambeth's Council Leader, and others making brief speeches. 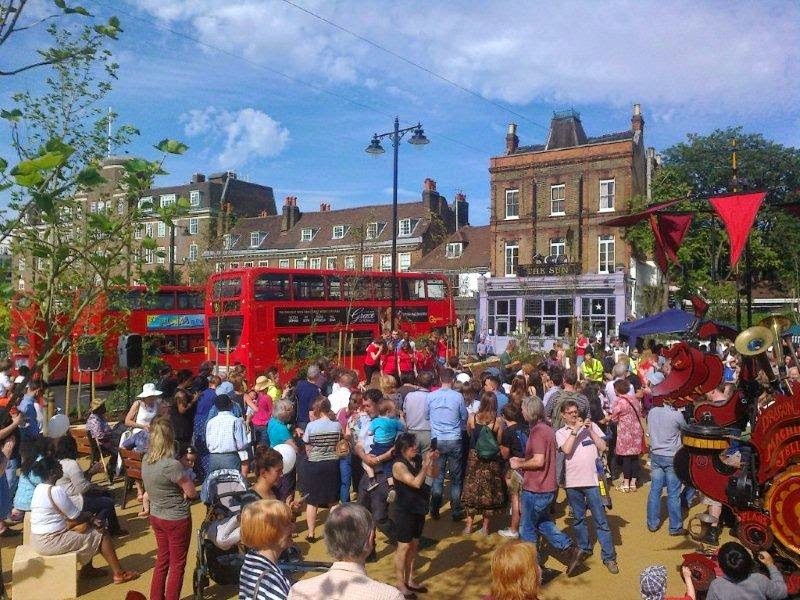 Clapham Old Town and Clapham Common tube station areas have been undergoing a major regeneration to create a new open space for all to enjoy, in a scheme costing £2.6 million. 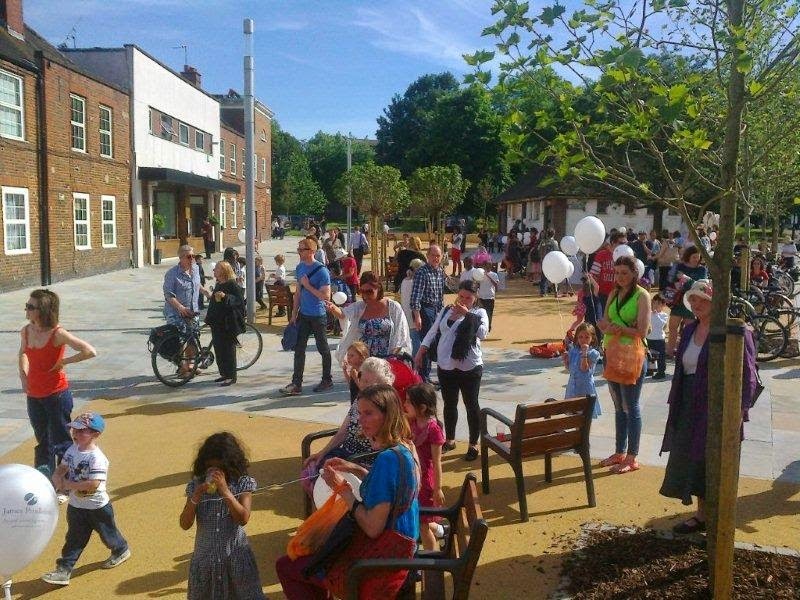 The improved area now includes: a new town square, wider pavements, new zebra crossings, new cycle paths and cycle stands, extensive landscaping with over 100 new trees planted and new seats throughout. 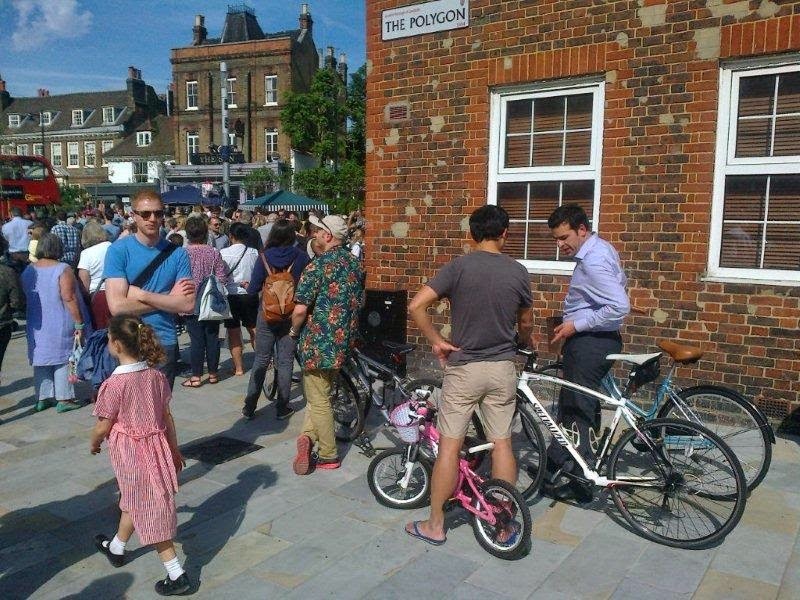 It was good to talk with several of the newly elected Councillors who are biting at the bit to improve cycling in the borough. I also spoke with one of the speech makers, Ben Plowden who is a local resident and TfL's Director of Planning, Surface Transport. All agreed that, while it is fair to launch it, the scheme isn't yet finished and needs to become more cycle friendly. This was apparent by the temporary structure (before a more permanent one) cutting down the amount of traffic that had been rat-running through the scheme. 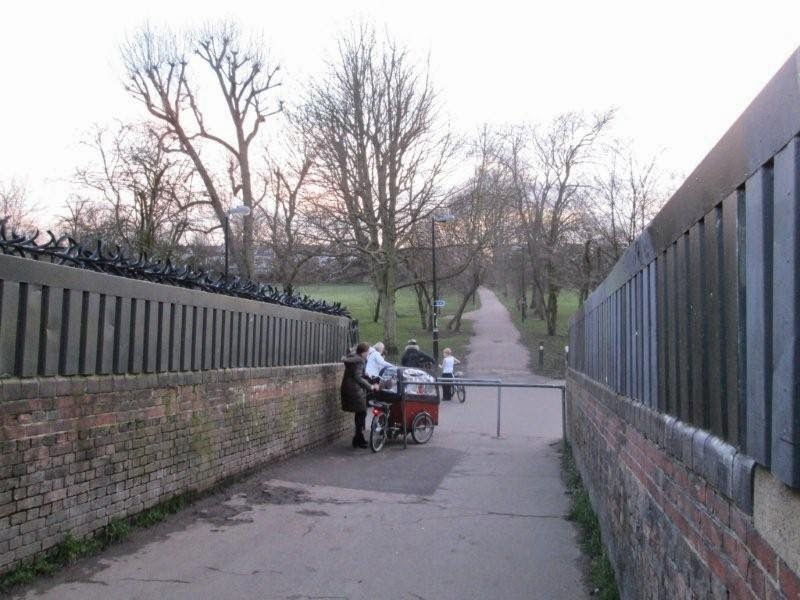 The inclusion of a cycling route to permit east-west cycling (in some measure as TfL have, to date, refused to permit a much desired crossing from Clapham Park Road) was a late addition to the scheme, following criticism from Lambeth Cyclists of its omission. 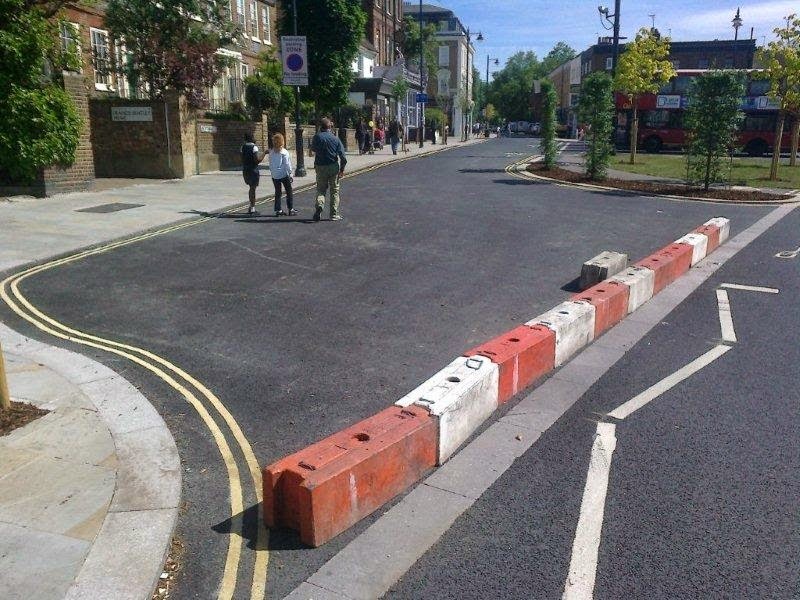 Lambeth deserve a lot of credit in the first place for a scheme which, overall, is a vast improvement on what existed before, and secondly, for adapting their scheme to include cycling measures at a late stage in the process. However more needs to be done here rapidly given the new Labour administration's intention that Lambeth becomes London's most cycle friendly borough. 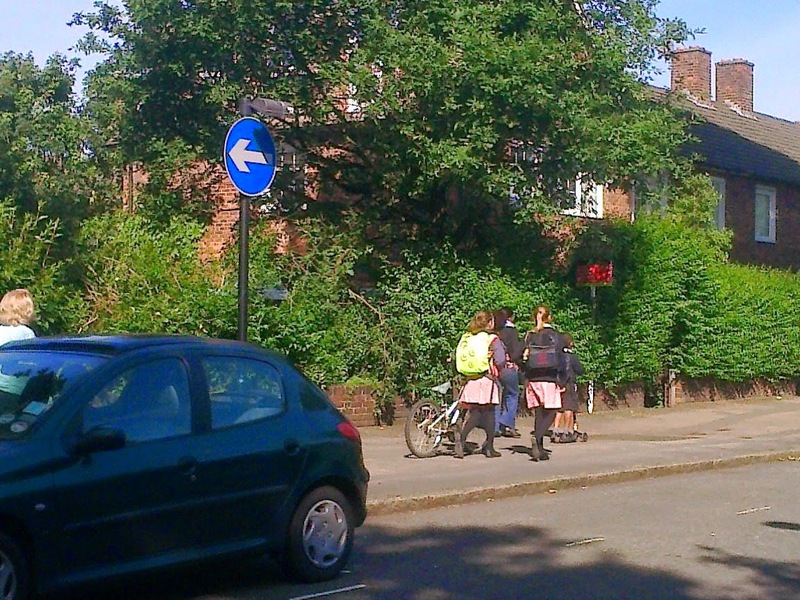 I took a school group on their bikes along The Pavement contra-flow today and, suffice to say, they didn't enjoy it. 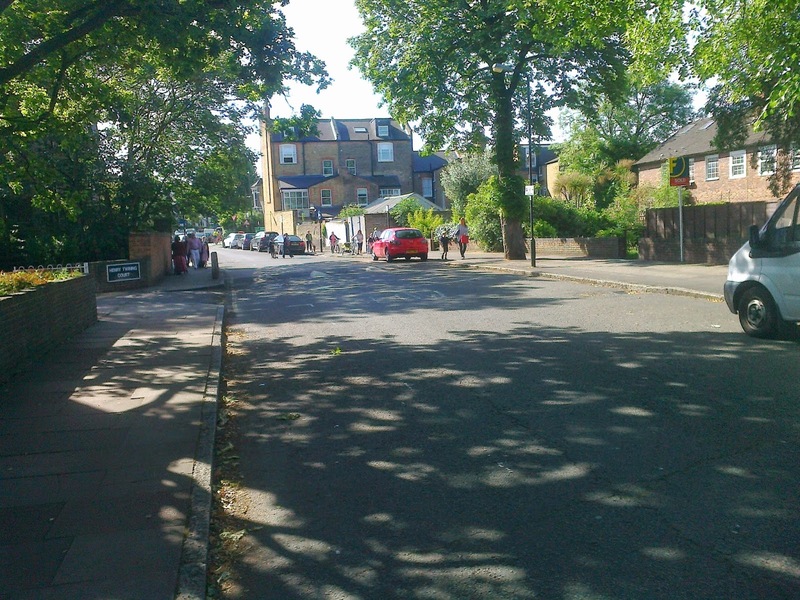 Crescent Lane in Lambeth runs, one-way, between Clapham Common (on which not many people live) and Abbeville Roads and a cluster of streets off it, on which many people live. 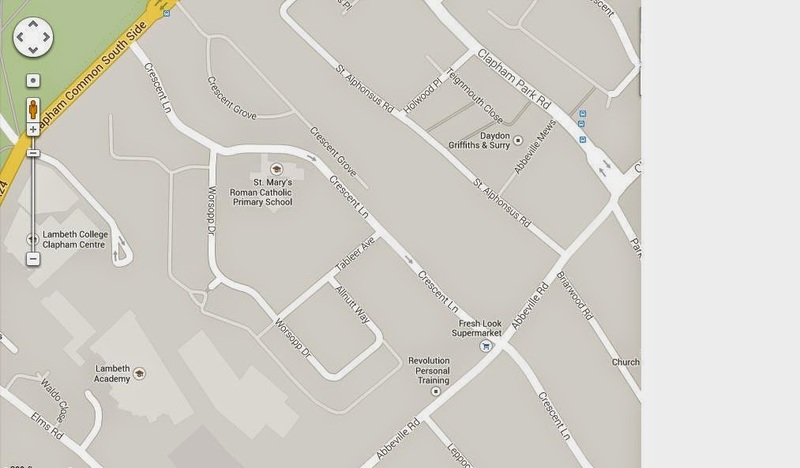 There is a primary school, shown on the map, on Crescent Lane that people from the Abbeville Road area travel to. 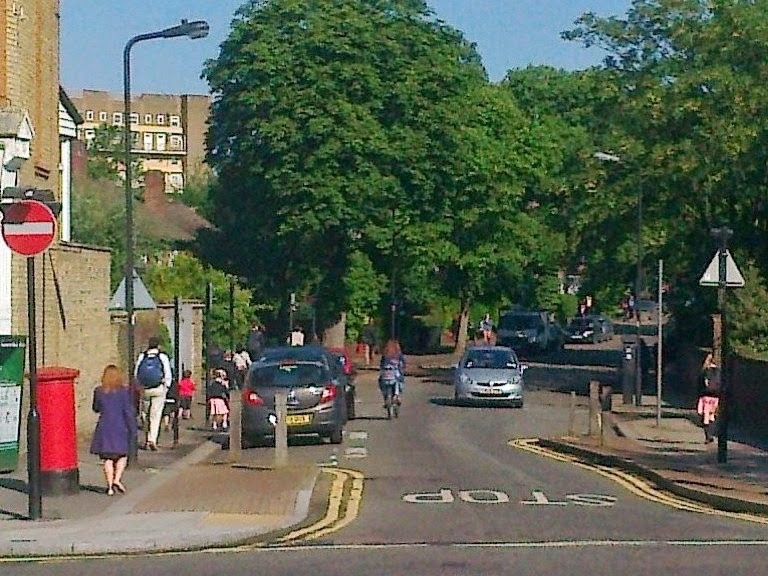 I am sure that Lambeth Council, dominated by Labour which pledged in its election manifesto to make Lambeth the most cycle friendly borough in London, will rapidly make this wide street with its primary school truly splendid for the children to cycle independently along in either direction.